I reviewed a number of beers for Epikur, the online magazine of The Wine School of Philadelphia, that are no longer online. I’ve reproduced them here for posterity. 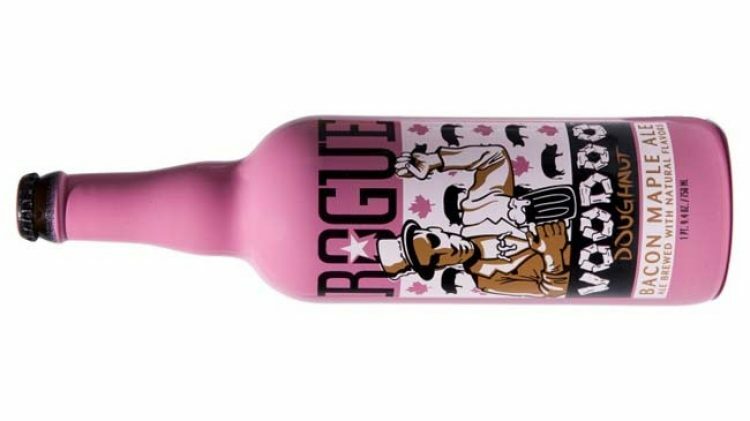 It’s hard to not be intrigued by Rogue’s Voodoo Doughnut Bacon Maple Ale. This is a beer that’s based on a doughnut flavor. It’s brewed with actual bacon, as well as pure maple syrup, and sold in a ludicrous pink bottle. Though this clearly a novelty to some extent, any beer lover would be hard-pressed not to have it on their to-do list. But is it any good? After trying it, I’m still not 100% sure. It did feature one of the more intense, intoxicating aromas I’ve ever experienced from a beer. As it sat on the table, over a foot away, I was enveloped in a cloud of fresh maple syrup, intense and satisfying. It was everything I could do to not run for the pancake mix. Sweet, rich notes of maple took the lead on the palate as well, followed by a quick burst of pork fat, and that’s when it got a little weird. And smoky. (The beer’s made with cherrywood, beechwood and hickory-smoked malts.) Of course bacon and smoke go hand in hand, but this smoke was different than smoked meat. It was more like a charcoal pit – initially pleasant, but eventually bitter and overwhelming. In the end, this one was about what I expected. Interesting to try, fun but odd, and not something to drink a lot of. I’d recommend grabbing a 750ml bottle and a few friends and giving it a run. Don’t forget the pancakes. Inspired by memories of the onset of Spring (and eternal hope, of course) at Shibe Park – which was located on Lehigh Ave. – Philadelphia Brewing Co.’s Fleur de Lehigh is a unique local choice for warm weather drinking. The beauty of this beer is that it’s smooth enough for a patio or tailgate session, but more flavorful than the average summer brew. The floral aromas and bright, fresh flavors are derived mostly from the spices added: ginger, lemongrass, rose hips, rhubarb and cardamom. The herbal aromatics are quite assertive, which, on one hand is what makes this brew so interesting, but on the other can cause a slightly medicinal flavor. As long as that doesn’t put you off, Fleur de Lehigh has enough complexity and personality to warrant repeat visits all summer long. Brasserie DuPont, one of the planet’s most renowned brewers (and producer of Saison DuPont, a beer that’s almost always featured on any “best of” list), does not collaborate with other brewers. In 166 years of history, they’ve never done it once… until now, with this “speciale” brew made for Philly Beer Week 2012. The collaboration was orchestrated by Tom Peters – owner of Monk’s Cafe and co-chair of PBW. Peters pushed for the brew to be Special Belge – a moderately rare, amber style of Belgian beer which he is particularly fond of, as well as the very American addition of smoked malt into the recipe. As with prior years, a raffle decided which local homebrewer will participate in the brewing of the official collaboration beer of PBW; in addition, the winner gets to pick a local brewer of their choice to make the trip with them. This year, homebrewer Vince Masciandaro chose Iron Hill’s Chris LaPierre; both men made the trip to Belgium to participate in the brewing process. The outcome was a delicious, unique brew that balances the maltiness of an amber with the crisp spiciness of DuPont’s signature saison. Up front, this beer is a tasty quaff of light caramel, and it finishes with an intriguing orange peel and clove crispness. It is dry enough to quench a thirst, but certainly not as dry as most saisons. Interestingly, I did not pick up the smoked malt during the tasting. Granted the conditions were not ideal – it was hot and crowded – and though there was certainly a unique, complex flavor, smoke did not come to mind. This is perhaps a good thing, as many smoked beers can be overwhelmingly smoky, which was certainly not the case here. To be the first to try this unique, exciting brew, you’ll have to go to PBW Opening Tap. After beer week is over, it’ll be available nationwide for a limited time. Dogfish Head. Victory. Stone. When discussing our country’s best breweries, those three must, at the very least, be in the conversation. So when they collaborate on the same beer, well, while there is no such thing as a guarantee of quality, this is about as close as it gets. Despite being (loosely) organized in’ 03, BUFF didn’t really do much until 2010, when they finally collaborated on the first Saison du BUFF. It was originally brewed at Stone, but then the other two brewers replicated the recipe at their own facilities. As such, there are actually three versions of this beer – one from each brewery. The result – at least from the DfH version that I tried – is a lovely saison. Ample biscuity sweetness balances nicely with the dry (but not overly dry) finish. Another interesting aspect is the parsley, sage, rosemary and thyme used; the herbs are quite subtle, but do add some complexity to the lingering coda. Though this is on the heavier side (6.8% abv), it’s a delicious patio sipper for the warmer months. After penning a treatise on the merits of local beer, I found myself torn over buying a Kona Brewing Company product. Though they are US-based, of course, Kona, HI, is further from Philadelphia than Brussels, Dublin or even Prague, so all the same downsides to drinking imported beer would seem to apply. Still, the idea of a Brown Ale brewed with real coconut was too intriguing to ignore, thus I found myself reading the label while browsing the Wegmans beer aisle. In tiny print, turned sideways, just barely noticable, was my clincher: “Brewed in Portsmouth, NH”. Turns out that Kona contracts with both Widmer Brewery in Oregon and Redhook in New Hampshire, in order to provide fresher beer and limit the environmental impact of distribution to the mainland. Contract brewing is a somewhat controversial topic in the beer world these days, but Kona appears to take every precaution towards quality, even adjusting the water mineral levels at each brewery to better approximate the Hawaii h2o. The Koko Brown itself is an interesting juxtaposition. From a brown ale standpoint, it’s robust and roasty, more like a fall or winter-style brown, but the intense coconut note that rounds out every gulp gives it a fresh finish reminiscent of the beach. This beer is certainly not for everyone; while some might judge the flavor combinations as unique and refreshing, others might assume they accidentally spilled some Banana Boat in their mug. There’s a trend in the beer world to brew with real coffee, typically in darker ales. Brown Angel, a “double” brown ale from Massachusetts’ Clown Shoes Brewing Company, however, shows that you don’t need to use actual coffee to invoke its essence. After pouring, a wave of mochachino wafts initially from the glass, with perhaps a hint of tootsie roll. This brew hits your tongue just like that morning espresso, complete with hearty roasted notes and dark, rich caramel. Though this is described as a hopped up brown, the bitterness melts into the coffee and chocolate notes with supreme balance. On the finish, there’s a hefty dose of alcoholic warmth, making this a great choice for the chilly nights of Fall and Winter. Does Brown Angel improve upon the standard English Brown Ale? Hard to say, really, since they are totally different beers. But for those who like the style as much as I do, this is certainly a worthy addition.